Students at The Priory School have a long-standing tradition of community service. Students participate in a number of community service initiatives, learning a sense of responsibility and the joy of giving. The Grade 6 students put on their elf hats and organized the annual Priory Santa's Flea Market. The spirit of the season is truly evident as our senior students helped our younger students shop for Christmas gifts at bargain prices for their family, and helped wrap their treasures, all the while raising money for charity. A heartwarming thank you to our Priory families for their generous donations. The Priory Student Council launched another caring initiative by teaming up with the Agape Association to help support seven families in need this holiday season. Each class collected non-perishable food, hygienic items, toys, clothing, gifts and grocery gift cards for the families. On Tuesday December 18th, Agape volunteers kindly collected over 40 boxes of holiday donations for the appreciative families. Agape organizers are dedicated to helping families in need and are grateful for The Priory’s commitment to the cause during this season of giving. Thank you to the Priory community for showing love, kindness, generosity and sensitivity to the needs of others. You make a notable difference in all that you do! Student Council organized a food drive to support St. Gabriel's Parish Christmas Basket Program. A heartwarming thank you to our Priory families for their generous donations of non-perishable food items. The Christmas Baskets were distributed to senior citizens and low-income families in nearby communities during the holiday season. Student Council thanks you for sharing the spirit of giving! In keeping with The Priory's willingness to ignite positive change while helping those in need, Tuesday, November 20th was designated Purple Day! Students, faculty and staff donned purple accessories including ties, socks, sweaters and scarves in exchange for a toonie donation. 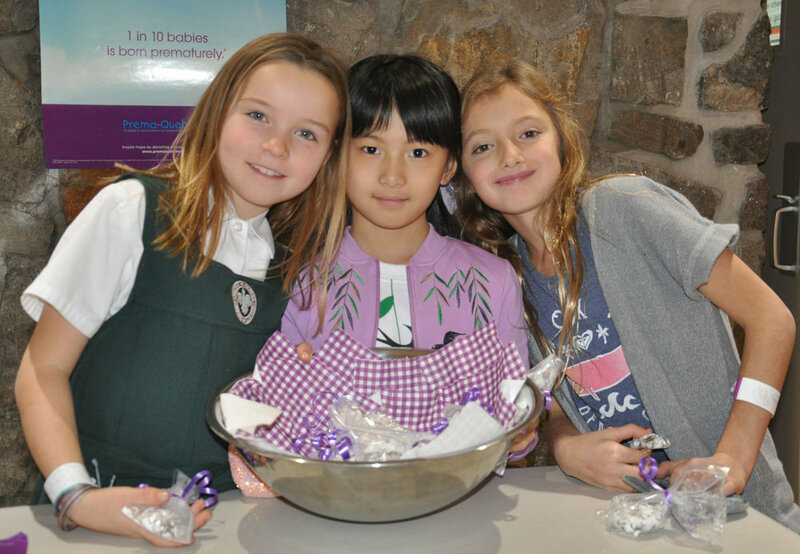 While wearing purple in support of World Prematurity Day, the Grade 3 students alongside their teacher, Mrs. Trionfo, packaged and sold delicious chocolate crinkle cookies to Priory students to raise awareness and money for the Jewish General Hospital Auxiliary’s Tiny Miracle Fund. Thank you to everyone who supported this great cause, $560 raised will go towards the purchase of the NICU’s new reading program “Books for Babies”. The Priory Student Council, led by Mrs. Rolnick and Mrs. Trionfo, sponsors two foster children as part of their outreach program. Thanks to a “Free Dress & Bake Sale” initiative by Student Council, our foster children, Ivan from Bolivia and Allassane from Burkina Faso will have nourishing food and new clothes to wear. The tradition of reaching out to others in need, reflects our pledge to “Ignite Positive Change” as we offer our support and compassion to others. Student Council appreciates how the Priory community gave so generously to allow our foster children to receive the care they deserve. The baked goods arrived in abundance early in the morning and allowed the bake sale to stay open all day! “Just Make a Mark, and See Where it Takes You”. This year, the youngest members of the Priory family are learning the importance of helping others in the community, and how even the smallest actions can have the greatest impact for positive change. Kindergarten students raised funds through a ‘Free Dress’ day on Friday, October 26th and will be collecting pennies over the coming months. As part of the 100th Day of School celebration, the Kindergarten Class will donate the collection to the Tiny Miracle Fund. Kindergarten invites you to donate those forgotten pennies and help make a difference in the lives of the tiniest members of our community. Donation jars are placed at the front office and in the Kindergarten classroom. A special thank you to the school community for supporting this event. At the Priory, we are committed to empowering our children to ignite positive change. On Tuesday, October 2nd our students, faculty and staff participated in Orange Shirt Day in support of indigenous children, families, communities and cultures who were affected by Residential Schools. Our student assembly leaders read “The Orange Shirt Day Story”, educating our student body how simply recognizing the mistakes that were made in the past is not enough. We also have the responsibility to actively do better and help make a difference, reminding us all that ‘every child matters’. Following Mr. Gentile’s inspirational words describing Terry Fox, Priory students, teachers and many supportive parents once again participated in the annual Terry Fox National School Run Day to pay tribute to a true Canadian hero and his belief that “dreams are made possible if you try.” Walking hand in hand around the school’s block, Priory students proudly joined over 8,500 schools across Canada to raise money for cancer research and helped share Terry’s example of hope, courage, and strength. As a result of a deeper learning project on fairness of international sporting events, the Grade 3 class decided to support fair game by raising funds for underprivileged children. All proceeds of their sales will go to “Right to Play”, an international organization which gathers funds to help create a healthy and safe world through the power of sport and play. Priory shoppers made their way into the Grade 3 “nut-free bakery” where they were received by the individual bakers and vendors. All proceeds of their sales went to “Right to Play”, an international organization which gathers funds to help create a healthy and safe world through the power of sport and play. The Paré Howlett Hall was filled with excited children, proud parents and Priory talent on Friday, May 11th on the Priory Denim Day. This year's annual Talent Show revealed once again how our school is filled with remarkably talented and confident children. Parents, classmates and teachers watched on as our aspiring artists from Grades 3,4,5 and 6 sang, danced and performed. Many thanks to Mrs. Rolnick, Mrs. Trionfo, Student Council, our MC’s Marilena Sahlas-Roy and Christopher Torabi and DJ’s Dempsey Hill and Riley McEvoy-Dennis, who provided an afternoon of fun and enjoyment. Outstanding performances everyone! The Talent Show came to a uplifting close when the entire student body joined the Grade 6 choreographers in Cha Cha Slide. Also a big thank you to students and faculty who wore demin to support National Denim Day and helped raise funds for the National Breast Cancer Coalition this year! Priory students and faculty stood in solidarity with the victims of the Humboldt Broncos and their families on Jersey Day, wearing their favourite sports jerseys to show their support. The message behind the Jersey Day campaign is : 'We are all one team'. Priory students made a $2 donation which went toward the families of the victims who are suffering from their loss, and in a heartwarming act of honouring the Humboldt Community, hockey sticks were left outside the Priory’s front door. Our hearts go out to all of those affected. On Friday, April 6th, Priory students joined students from Sacred Heart School in a march for Sounds of Hope - Bruit d’espoir. Walking hand-in-hand together with whistles and other noise makers, students raised awareness for a heartfelt appeal by children for sick children at the Montreal Children’s Hospital. Cars and trucks honked as they passed by the train of student supporters. $6700 was raised through this worthy cause and celebrated during a school rally. Thank you Sacred Heart for showing such appreciation and gratitude. After hearing about a family's struggle who recently arrived in Montreal after a long journey from Nigeria, the Grade 4 students wanted to help in any way they could. On a cold winter's day, the Grade 4 students held a Hot Chocolate Fundraiser during lunch recess to help support the family in need of home essentials and warm clothes for Montreal's cold winter months. The class is also collecting non-perishable food items and household goods. A warm thank you to the Priory community for their generosity! The 4th grade students raised over $400 from their Hot Chocolate Fundraiser, and will continue collecting non-perishable donations. Kindergarten participated in some exciting activities with the Grade 5 students on their “Amazing Race in Search of Amazing People” event. Together, they supported a few different charities in and around the Montreal area. The Kindergarten class collected non-perishable food items for donation to the NDG Food Depot and new white tube socks for donation to Toe2Toe (an organization that supplies clean white socks to the homeless). A BIG thank you to our Kindergarten parents for their help in igniting positive change in the community! Priory siblings Gianluca and Giuliana Cecere along with their Nonna, hosted an “espresso and cookies” fundraiser, as part of the fundraising initiatives for the victims of hurricane Irma. While Nonna Olympia affectionately prepared and served espresso coffee to parents and teachers, Gianluca and Giuliana distributed cookies that had been lovingly hand-packaged for gift giving by Giuliana herself. Donations from the fundraiser were given to the Canadian Red Cross to provide assistance to families impacted by this devastating hurricane. Thank you Gianluca, Giuliana and the Mattei Family who sponsored the espresso, for igniting a positive change by reaching out to others in need. Mr. Pare from the Red Cross (responsable des financement Monteregie) graciously accepted a cheque in the amount of $1,052.37, raised through the generous contributions from the Priory community. Our prayers and thoughts are with the victims and their families affected by this tragic event. In response to the devastating flooding in certain areas in Quebec (specifically the West Island) and ensuing hardships suffered by families, Friday, May 12th was designated a "Free Dress Day" at The Priory. Each student participated and helped by bringing in $2 and a non-perishable food item or toiletries.The money raised went directly to the organizations taking care of the victims. What does it mean to make healthy choices? During ‘Nutrition Month’, Principal Tim Peters and our Grade 6 student ambassadors, launched a health awareness campaign and challenged Priory students to adopt healthy habits while raising funds for the McGill University Health Complex (MUHC). During a school assembly, MUHC clinical dietitian, Popi Kasvis, had students demonstrate the amount of sugar in popular beverages and challenged them to make healthy choices. Students were particularly astounded to learn how much sugar is added in some of our popular and favourite drinks. Encouraging their peers and teachers to ‘step up’ their current routines, the Grade 5 students organized a pedometer fitness challenge promoting physical activity and exercise. At The Priory, eating healthy food and exercise are always part of the daily menu. The goal of the Healthy Student Challenge is to encourage everyone at The Priory to pledge to incorporate a new healthy daily habit while in turn supporting the MUHC. Keep fit everyone! When Mrs. Trionfo started baking years ago with her class, she knew her students would love it but she didn't realize how much of a positive impact it would have on her class. Today, baking is part of her curriculum and is also used to help others in the community. When Grade 3 students wanted to say thank you to the Kahnawake Social Workers for their compassionate work with their community, the students created kindness hearts, and put their passion for baking at work to lovingly prepare chewy chocolate chip cookies. A special thank you indeed! On Wednesday, May 25th, Grade 2 organized a Lemon-Aid Fundraiser for the Fort McMurray Fire Relief through the Red Cross. Over $400 was raised to help those in need. Grade 2 worked hard to develop a plan and make the fresh lemonade. Much thanks to Grade 3 for the cookie contribution, Grade 6 student Grayson Csik for his Lemon-Aid stand, Les 5 Saisons Westmount for the donation of 100 lemons and to everyone who helped to support the cause! Dr. May Khairy, Pediatrician and former Priory student, addressed the participants communicating the two medical equipment proposals that the MUHC wishes to purchase with the Toonie Challenge funds raised. Following her talk, students and staff were invited to visit a series of interactive kiosks designed to describe and explain the work being done at various MUHC departments. Students engaged in proper hand washing, used surgical computerized instruments, manipulated the brain and eyeballs, learned about nutrition and some even received a temporary short arm cast to take home as a souvenir. Students from LCC, Roslyn, Selwyn House, St. George’s, Willington and The Priory were very grateful for their unique learning experience while realizing that their donations will benefit others. Thank you to the Toonie Challenge Co-Chairs, Andrea Howick and Nicole Small, Priory parent and committee member, Courtenay Price-Gallagher, and their entire volunteer committee who dedicate themselves to helping patients and involving the children in their mission. The Grade 5 and 6 Expedition Group, led by Mrs. Sherriffs, Mrs. Raymond and Mme Martineau, while focusing on a unit of study on Biodiversity, launched a 'Save the Sharks' campaign during the first week of December. Students spent the week creating posters, making announcements during assembly and rallied to raise awareness of the shark crisis in Costa Rica. Thanks to everyone’s support, this awareness campaign raised $1,131 and as part of a raffle draw, four children spent a delightful Friday afternoon with our lovely kitchen ladies, Lucia Mastrogiacomo and Romana Zangrillo baking chocolate chip cookies. At The Priory, Halloween isn't only about receiving treats and dressing up in costume. It's also about reaching out. Thanks to Priory parents' contributions to last year's Halloween Party, The Priory adopted Jethro, who was born, raised and retired from a medical lab, and Maya, who spent most of her life in a zoo. Both Jethro and Maya can now live out the rest of their lives enjoying retirement at the Fauna Foundation Chimpanzee Sanctuary in Montreal. The contributions help the Sanctuary with the purchase of food, new toys and also help to expand the living environment for the resident chimpanzees. For years children have been asking, "how come the teachers don't participate in the Beep Run?" This year was very different because instead of just asking the question, Grade 6 student Chloé Lee-Gauthier turned the question into a fundraiser and ensured its success. The morning of Friday, June 13th, Grade 3,4,5 and 6 students gathered in the gym to cheer on their teachers and Principal Tim Peters, whose goal was to beat the present student record of level fourteen. Thanks to everyone who made a donation, money was raised for 'Right to Play' which uses sport and play to educate and empower children facing adversity. The Priory School, remaining true to its tradition of giving and helping others in the community and around the world, called upon a very dedicated parent, Mrs. Suzanne Csik, to help organize a very successful Daffodil Bulbs Project. Westmount Florist and Pinkerton Florist owners responded to Mrs. Csik's request by donating in total over 1400 Narcissus Bulbs arriving from Holland. The Priory Grade 3 class took on the project and advertised, packaged, sold, and delivered the lovely parcels of bulbs to the eager and generous students and their families. After only one short week, the entire batch was sold and $1,110 was raised and will be sent to Child Haven International and Breakfast for Learning Program in Montreal, two organizations dedicated to helping children. Once again the Priory community showed its commitment to help those in need by donating generously. Earlier in September, there was a fire in the orphanage at Shitima Community School in Kabwe, Zambia where The Priory School's former Afterschool Coordinator Cluny Mackenzie works. In keeping with our strong sense of community, The Priory held a school-wide bake sale on Thursday, September 27th for Shitima School, which provides education, shelter and daily meals to orphans, and other vulnerable children who would otherwise live in great deprivation. The Shitima Café opened and students and their families purchased baked goods prepared lovingly by Priory children, parents and staff. This creative initiative raised an outstanding $1877 which will go towards the purchase of personal belongings such as cloths, shoes, school uniforms and towels for 24 children who lost everything in the fire. A big thank you to all our wonderful bakers and to our Grade 6 students who worked tirelessly to make Shitima Café a success.